“I will only accept blood from my own veins or from my Aunt Margo! That’s it!” Autologous and directed blood donations happen much less often in 2019 than in the past, but should they still happen at all? 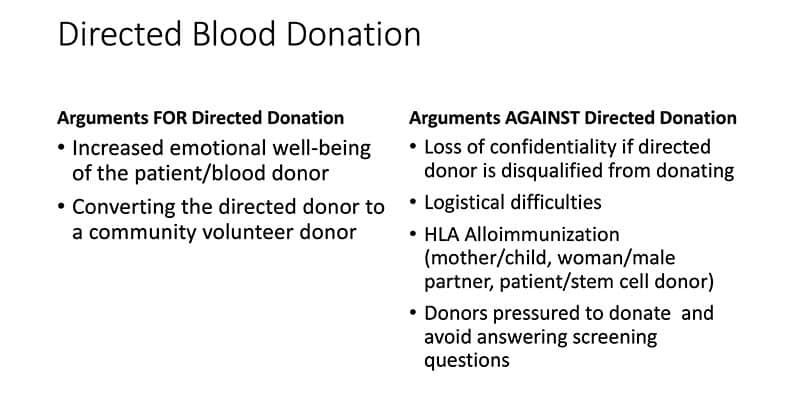 For patients who might need blood transfusion, the ideas of donating their own blood (“autologous donation”) and/or choosing their blood donor (“directed donation”) seem VERY appealing! However, as Julie Karp describes, both practices have declined precipitously in recent years. Back in the 1980’s, HIV was a newly discovered virus and we had no test for the virus we now know as hepatitis C. Patients back then were very interested in making blood transfusion as safe as possible. As a result, the frequency of both autologous and directed donations increased dramatically! However, HIV transmission through blood is now spectacularly rare, and blood has never been safer from viruses. Does it still make sense to pursue either type of blood donation? In this interview, Dr. Karp explains the pros and cons of these “special blood collections,” and shows us why they are not always a great idea. She also outlines situations where either type of donation might still actually be helpful. Obviously, if mom’s an O and daughter’s an A, I’m not giving daughter’s A blood to mom. I don’t care how much you love her! Hemolysis doesn’t care! 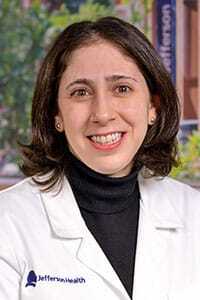 Julie Katz Karp, MD, is Medical Director of the Blood Bank at Thomas Jefferson University Hospital in Philadelphia, PA. She is an Associate Professor in the Department of Pathology, Anatomy, and Cell Biology, and she is the Program Director for the Transfusion Medicine Fellowship. Dr. Karp also oversees the Thomas Jefferson Blood Donor Center. Dr. Karp has served on numerous national committees, including those of the AABB and the College of American Pathologists. Her academic interests include undergraduate and graduate medical education specifically related to Transfusion Medicine, as well as blood donor health and recruitment. DISCLAIMER: The opinions expressed in this episode are those of my guest and I alone. Those opinions do not necessarily reflect those of the organizations with which either of us is affiliated. This podcast does not constitute formal medical advice. Please discuss all medical issues and decisions with your local health care providers. Neither Dr. Karp nor I have any relevant financial disclosures. The images below are generously provided by Dr. Julie Karp. Another great show, Joe! I had expected to hear some discussion regarding the increased risk of TA-GVHD in closely related donors but didn’t. From your previous podcast on this topic it was my understanding that closely related donors need to have their blood irradiated because of this increased risk of TA-GVHD. In the example case presented it was mentioned that it took about 4 days for a family member’s blood to go from donation to transfusion. Does this include time for irradiation or does that add further delays? 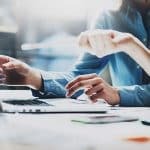 Bruce, as you point out, I have discussed the need to irradiate products from donors who are family members in previous podcasts and posts on my site. You comment is fair, though, and it is something I could have asked Dr. Karp about during this interview. The answer to your question is that irradiation is actually a very quick process, and it generally does not add significant time to processing. Thanks for writing! A great question! Yes, in the example presented the unit was irradiated. We have an irradiator in-house and, as Joe mentioned, it doesn’t take very long. It adds about 15-30 minutes, depending on staffing. Twenty years ago, when I had my first surgery, I actually asked the surgeon in advance if I could donate my own blood. He gave me a flat no and he also denied any other alternatives, like intra-operative salvaging which I also suggested. Later, I developed a condition that was partly due to ischemia. I went back and looked at the medical record and found out he did not even transfuse me with any blood, even though my final hemoglobin before discharged was only 6. Did that $200 unit save the system money? 2 more surgeries and 9 ED visits later, the hospitals made a lot of money out of me. The decline is also due to discouragement by doctors. 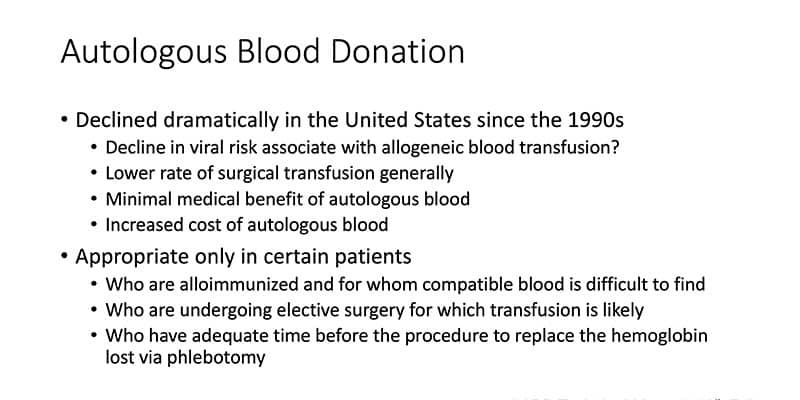 I personally believe that autologous should be used less, and other alternatives more (for example, bumping up a patient’s hemoglobin before an elective surgery using a variety of methods is a better solution to me than collecting autologous blood and having the same patient go into the surgery at a lower hemoglobin). Can’t speak to the “opinion” part of your comment.